You can't trust dogs to watch your food. There are three possible Easter dates depending upon the year and your cultural and religious persuasion. Most Easter information elsewhere on the Web is written with the author's own circumstances foremost. This article gives just the alternatives. 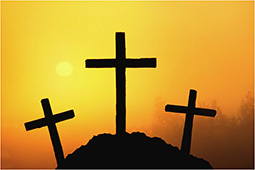 Easter Sunday is the Sunday following the Paschal Full Moon (PFM) date for the year. In June 325 A.D. astronomers approximated astronomical full moon dates for the Christian church, calling them Ecclesiastical Full Moon (EFM) dates. From 326 A.D. the PFM date has always been the EFM date after March 20 (which was the equinox date in 325 A.D.). "Easter Sunday is the Sunday following the full moon after the Vernal Equinox." Vernal means springtime, and countries in the Southern hemisphere have opposite seasons to those in the Northern hemisphere. Of course, Easter is not celebrated in September in the southern hemisphere! So the reference is really to the March Equinox, but even that is equally wrong in this definition, but for different reasons (see below). Also, I think that almost everyone reading this would assume that "full moon" refers to an astronomical full moon date. An astronomical full moon (AFM) occurs at one instant in time, and therefore occurs on 2 dates around the world (at any instant it is midnight somewhere in the world, with different dates for locales on either "side" of midnight). Again, countries do not celebrate different Easter dates based upon their own full moon dates! Many definitions misuse use the phrase "after March 21st" in an Easter definition. This usually arises because Easter is the Sunday after the first EFM date after March 20. There are two "afters" here, so the earliest possible Easter is March 22. Some people have tried to simplify this concept by using one "after" with the date to March 21, so it reads "the full moon after March 21". This logic is seriously flawed! It is further compounded with phrases like "from March 21". This is unclear whether it means "from and including March 21" or "after March 21". One bizarre encyclopaedia definition gets it so wrong that it concludes that Easter Sunday can never fall on March 22! Absolute rubbish! How are full moons related to Easter? Astronomical Full Moons dates are not directly related to Easter dates. Easter is based upon Paschal Full Moon (PFM) dates, and each PFM is the particular Ecclesiastical Full Moon (EFM) date after March 20. EFM dates are approximated astronomical full moon dates, and are surprisingly accurate when you consider how long ago they were forecast. PFM dates are found in a table (see above). There is a table of 19 dates for the Julian calendar, and several 19-dates tables for the Gregorian calendar. 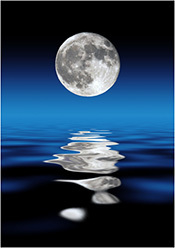 A Saturday April 10 PFM, with the nearest astronomical full moon as late as April 12 & April 13. For most Easter Sundays, the nearest astronomical full moon date can be anything from 10 days earlier (over a week before) to 2 days later (on the Tuesday after Easter). How is the equinox related to Easter? The equinox is not related to Easter! March 20 is the critical date for determining all Easters, and March 20 was the equinox date in 325 AD when the definition of Easter date was agreed. In our current Gregorian calendar, the March Equinox is one of 5 dates from March 18 to 22. What can I do when I see a wrong definition? Easter Sunday is the Sunday following the Paschal Full Moon (PFM) date for the year. In June 325 A.D. astronomers approximated astronomical full moon dates for the Christian church, calling them Ecclesiastical Full Moon (EFM) dates. From 326 A.D. the PFM date has always been the EFM date after March 20 (which was the equinox date in 325 A.D.). The PFM date is an EFM date that estimates an astronomical full moon date. PFM dates in our Gregorian calendar always occurs within 3 dates, before or after an astronomical full moon date. Therefore, Easter Sunday occurs around the time of an astronomical full moon, but the astronomical full moon has nothing to do with determining Easter Sunday date. Because the Gregorian March Equinox date is one of 5 dates from March 18 to 22, and Easter Sunday dates range from March 22 to April 25, Easter sometimes occurs around the time of the March equinox. But again, the March Equinox has nothing to do with determining Easter Sunday date. Almost exactly half of Western Easter Sunday dates occur on the same date 11 years later (but never more than 4 in a row). The Gregorian calendar has gradually replaced the Julian calendar over a period of a few hundred years from October 1582 to re-align dates with the changing motions of the earth and moon in relation to the sun. Christians of Western denominations have generally adopted a revised Easter Sunday calculation based upon the Gregorian calendar, which more closely aligns PFM dates with astronomical full moon dates. This revised calculation has often been used from the commencement of the Gregorian calendar. In other cases it has been applied at a later date, or not at all (eg Orthodox churches). 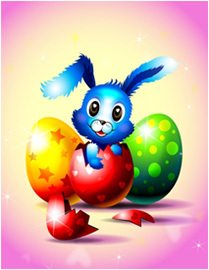 1583 was the first year Easter occurred with the revised calculation in the new Gregorian calendar. Devised predominantly by Lilius and Clavius, they were introduced in October 1582 by Pope Gregory XIII. 1753 was the first year Britain and its colonies (at that time) used both the Gregorian calendar and the revised calculation for Easter. Here's a page showing history of the major events that shaped the calendar and Easter dating methods. The Gregorian calendar has gradually been adopted world wide from October 1582. The last known use of the Julian calendar was by Greece in 1923, so method 1 applies only historically. Either at the time of their calendar change or at a later date, some (but not all) regions have used the revised Easter date calculation based on the Gregorian calendar. The current Gregorian calendar is valid until at least 4099 AD. At the adoption of the Gregorian calendar, most Western churches moved from method 1 to method 3, while Orthodox churches moved from method 1 to method 2. Has used the Gregorian calendar since settlement. Western churches & public holidays use method 3. Orthodox churches use method 2. For years 326 to 1582, use method 1. What was then Italy changed calendar AND calculation method in October 1582, so for years 1583 to 4099, use method 3. Most mainland European regions had converted to the Gregorian calendar by 1700. For years 326 to 1752, use method 1. Adopted the Gregorian calendar in September 1752. Use method 3 for Western churches for years 1753 to 4099. Use method 2 for Orthodox churches for years 1753 to 4099. Regions of Northern America under French influence adopted the Gregorian calendar in October 1582, while regions under British influence adopted both the new calendar and revised calculation from September 1752. Use method 2 for Orthodox churches after the adoption of the Gregorian calendar. Use method 3 for Western churches after the adoption of the Gregorian calendar. Here are some other Web pages on Easter Date Calculation.